During Rev. Jensen’s second pastorate at Emmaus, World War I broke out in Europe. Sixty-three young men from Emmaus served in the war; Immanuel Andersen was killed in battle in France, and Andrew Simonsen died in training camp in Kansas on October 4, 1918.World War I began a major change in the role of European ethnicity in American life, no less at Emmaus than anywhere else. Up until this time, not one of Emmaus’ pastors had been born in this country. Sunday morning worship services were held in Danish only; at the end of Rev. C. H. Jensen’s second pastorate in 1921, English services were held only twice a month, on Sunday evenings. While Danish Americans – particularly those whose families hailed from Schlesswig-Holstein – enthusiastically supported the allies in World War I, Americans in general grew openly suspicious of immigrant groups who refused to adopt the ways and language of the United States. During Andersen’s nearly 22 years at Emmaus, confirmed membership grew from 387 to 647. He was succeeded in 1943 by Rev. Ole V. Magnussen. It is sometime during World War II that Danish worship services at Emmaus were discontinued. 114 young people from Emmaus went into military service during World War II. Three young men gave their lives: Lloyd Martin, Warren Olsen, and Lyle Petersen. Magnussen was succeeded in 1949 by Rev. Sigurd D. Petersen. 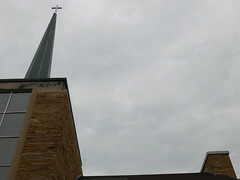 The congregation began considering a move to another location that year, an idea encouraged by the nearby Western Publishing plant’s interest in the church property. The church had grown to 950 baptized members, and the old church was too small to accommodate the most heavily attended worship services. After considering sites on the west side of town, the congregation approved the purchase of property on the corner of Summit Avenue and Yout Street on the northwest side. The groundbreaking service for the new building was held on May 30, 1954. Prior to the placing of the new church’s cornerstone, the old Mound Avenue church’s cornerstone was opened on October 3, 1954. It contained the 1872 church constitution, a Danish testament, and the January 6, 1875 Racine Daily Journal. These effects were placed inside the new box along with copies of the 75-year anniversary book in English and Danish, the centennial book, a 1953 annual report, the January and October 1954 issues of the church newsletter, programs from the kick-off dinner of Lutheran High School, the May, 1954 ground-breaking story and the June 1, 1954 Racine Journal Times. 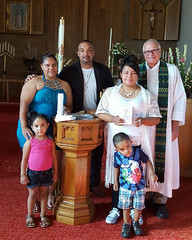 The photo at left shows Rev. 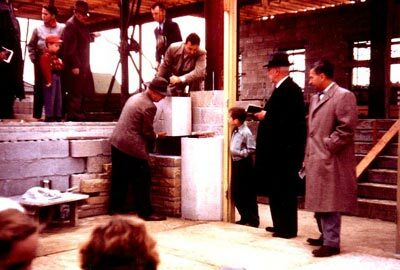 E. R. Andersen (holding book) and architect Harry Ollrogge (far right) looking on as congregation president Hans Jepsen and Building Committee chair Harry Andersen laid the cornerstone as part of the dedication service on October 10, 1954. The final worship service at the old church was held October 9, 1955. The first worship service at the new church was on Easter Sunday, April 10, 1955. The choirs of Emmaus, Immanuel, Bethania, Our Savior’s and Gethsemane Lutheran churches participated in a series of dedicatory worship services over consecutive days beginning October 16, 1955. More than 600 persons attended the Sunday afternoon Dedication service, at which UELC Synod president Dr. H.C. Jersild led a procession of sixteen pastors, church council members, the building committee, and the church choir to the altar. Mrs. Marie Lange directed a photo display and pageant, “The Emmaus Story,” after a “Remembrance Night” worship service on October 17. Rev. Magnussen preached at a “Challenge Night” service on October 18, and a son of the congregation, Rev. George Demant, preached at the “Vision Night” service on October 19. 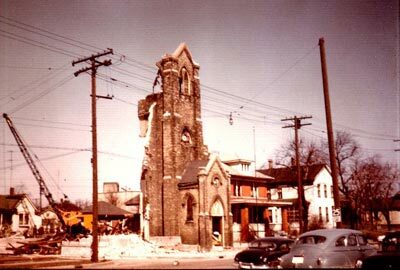 The old church was demolished on March 13, 1956. The old church bells were installed at the YMCA Camp Anokijig. A recording of the old church bells was used over an electronic chime system at the new church from 1957 until a Schulmerich carillon replaced it 1977.